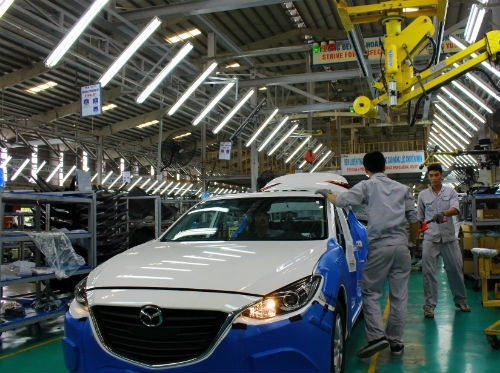 Automobile companies are forced to cut back production in Vietnam following lower tariffs among Southeast Asian countries but said they would maintain operation in the country. Under a regional free trade agreement, tariffs on imported cars from countries in the Association of Southeast Asian Nations (ASEAN) has been cut to 30 percent this year from 40 percent previously, before being eliminated in 2018. The lower tariffs are putting great pressure on automakers in Vietnam, who are concerned over their competitiveness or even cannot survive amid rising inflows of imported cars, Dan Tri News quoted Toru Kinoshita, general director of Toyota Vietnam, as saying Tuesday at a meeting with the Ministry of Industry and Trade. Kinoshita said the company has scaled down production, focusing now on four models rather than five in the past. The firm is considering further cuts to two or three models and increase output of each model instead. A Ford Vietnam representative said the firm focus on production of one or two models, which have good sales and can be exported. The lower import duty on ASEAN cars is threatening the Vietnamese automobile market, which has lagged behind Southeast Asian peers. Statistics by the International Organization of Motor Vehicle Manufacturers showed Vietnam produced 50,000 cars in 2015, compared with more than 1.9 million in Thailand, over one million in Indonesia and 614,000 in Malaysia. The production cost of a vehicle in Vietnam is 20 percent higher than that in neighboring countries due to the scale of the market, which is only equivalent to one-fifth of Thailand or one-sixth of Indonesia, industry players said. 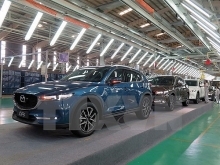 Truong Thanh Hoai, a senior trade official, said the authorities were working on solutions to promote the automotive industry such as adjusting special consumption taxes on locally-assembled vehicles or strengthening technical berries on domestic markets. Last year, Vietnam ranked the world's second fastest growing car market after expanding 27 percent from 2015, according to a study by the U.K.-based market analysis firm JATO. The country sold a record 304,427 cars in 2016, up 24 percent from the previous year and nearly twice the number in 2009, based on industry reports.